Waterbased Pyrethrin ULV is new technology that delivers effective control of Stored Product Pests, Cockroach control and the control of biting Insects, without oil residues and oil-related issues. Water-based ULV is easy to use, being less of a hassle at time of application. There is no need to shut down pilot lights or lockout equipment and there is less clean-up after application with no oil residue. It's even safe to apply directly to landscaping plants. 1/2(64oz) gallon container mixes in 55 gallons of water for mosquito misting systems. Would you like to see the Riptide ULV Pyrethrin MSDS sheet? 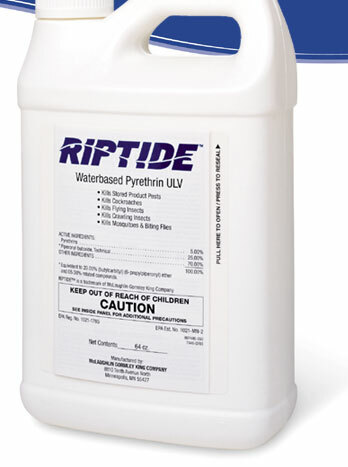 How about the Riptide Waterbased Pyrethrin Label?